I very much enjoy being a product tester who can shed some new light on innovative products out there, and I have to say that this latest diaper I have tried can definitely qualify as being the most innovative, unique, creative diaper I have ever tried to date. 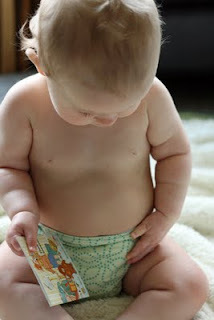 Typically the cloth diapers I have tried (a great many of them!) have rectangular inserts (most frequently microfibre), with some sort of stay-dry lining (most often microsuede or microfleece), and the vast majority of the one-size ones I've tried have adjustable rise snaps. The latest diaper I have tried, the ION by Evolution Diapers has none of these features, yet it is a one-size, stay-dry pocket diaper. I'm excited to share its unique, groundbreaking & newly patented technology with you! The ION diaper, the brainchild of Evolution's CEO, Stacee Magee, is probably the most adjustable modern-styled diaper I have come in contact with. It features fully adjustable elastics for both the leg and waist, allowing the leg openings to flex from a teeny tiny 4 inches all the way to a chunky 14 inches at the thigh. At the waist, the elastic & snaps combo can cinch the waist from a generous 22 inches all the way down to a newborn-sized 9 inches. Truly, I believe that this diaper could deliver on its promise to diaper your child from newborn days all the way to potty training days--or, from 5-40 lbs. I love that the elastic has notches down its ENTIRE length (not just 4 or 5 notches to choose from like some other brands). This is what truly gives it its versatility. In my opinion, though, one shortcoming that the elastics did have when compared to FuzziBunz (another commonly-known elastic cinching brand) is that FuzziBunz has labeled their elastic buttonholes with numbers on either side (1, 2, 3, 4 etc) and has recommended sizings to correspond with each. 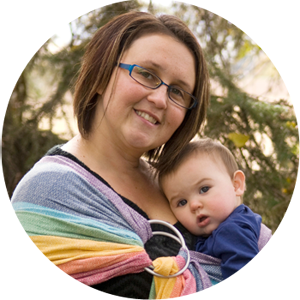 I found that when FuzziBunz sent this along, I immediately knew what size to go to for my baby's current weight, and I could quickly and efficiently make sure that the elastics were symmetrically done up to the same numbered notch on either side. With this Evolution ION, I did find that I had to do a bit more "playing around" with it when I first got it out of the package, to ensure that the size was the right fit for our little girl and that both leg holes were matched on the same notch (I had to manually count each notch with my fingers to make sure they were identically buttoned up on either side). Although this didn't take too long with only having one diaper, if you ordered an entire set of these, it would take a bit more time to "set up" out of the package than some other brands. However, I think if what you're looking for is a huge degree of flexibility of versatility, this would still be worth it, by far. One thing I also love about this elastic is that it gets completly tucked in and hidden in every way once you're done adjusting it, which makes for a very sleek, streamlined, and comfy looking diaper. As you can see, these flexible elastics really do enable the ION to have a perfect, teeny-tiny newborn-esque fit, superior in sizing and trimness to most other rise-snapping pocket diapers. 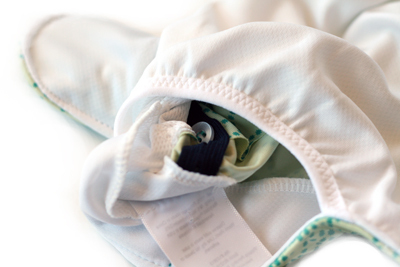 The ION is still a pocket diaper though, and it comes with two very unique inserts that are contoured to perfectly fit this diaper's pocket as well as baby's body. 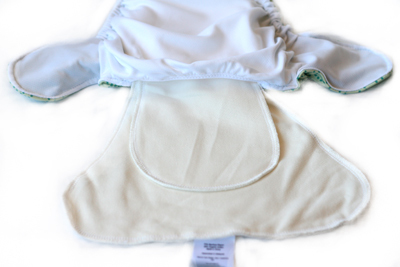 One insert is smaller, for when the diaper is sized much smaller--it has a contoured shape and comes in either a hemp/organic cotton blend or in a bamboo viscouse blend. I received the bamboo insert and was pleasantly surprised just how thin it was (much thinner than a microfibre insert). Although not soft and fluffy like microfibre, this insert still had super absorbant properties and was much less bulky in the pocket as it laid nice and flat. 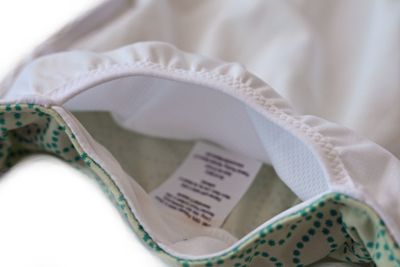 The larger insert has contoured "wings" towards the back (to fill in the tab sections of the diaper's snapping portion, near the bum) that ensure extra moisture absorption even through the seat of the diaper, especially during naptime. All the inserts have multiple layers sewn in to make them super absorbant. The inner lining of this pocket diaper itself is something else that makes it totally groundbreaking and unique. 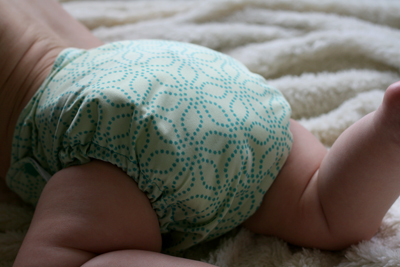 Stacee of Evolution Diapers insists that fleece, a material designed for warmth, is not the ideal fabric for the inside of a an already hot and humid diaper. Evolution Diapers have stayed completely fleece-free and their inner lining is made of COOLMAX fabric, which is a high performance soft, breathable layer that has strong moisture wicking properties. Its technology helps to pull moisture away from the baby's skin as well as absorb and disperse it across its surface area and into the absorbant pad positioned below it. 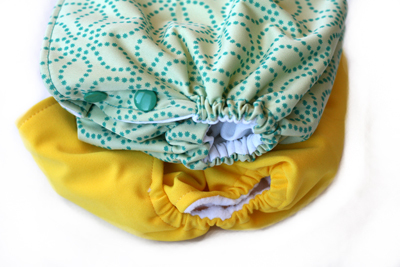 It then is highly breathable, allowing for airflow to return to the surface to cool and dry baby's bottom. 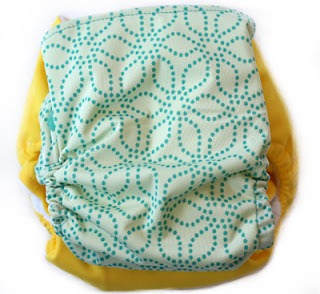 When I first got this diaper, I was skeptical about this fabric's stay-dry abilities because it is super thin and airy, and I thought moisture might sop right back up through its layers. The feel of it reminded me a bit of a jersey type athletic material. Honestly though, this COOLMAX fabric really does have great wicking abilities and does feel much cooler than the fleece, especially as we're heading into summer. I think it's a great technology for wicking! Another great feature? Because it's so absolutely smooth, I find that poop slides and flicks right off of it over the toilet when your baby is being fed solids whereas the fleece often sticks worse as it is so textured. Because of the trimness of this waterproof shell and COOLMAX lining, this diaper fits so well at any weight bracket, staying trim and not bulking up in any sections. It also is super fast drying, even on the line, and maintains a soft flexibility even after several washes. In terms of snapping on the waist, the ION has side-snapping fasteners at the waist and several columns of snaps to still get a custom fit (even once the elastics have been done up inside). It really is as "easy" as a disposable diaper to put on as you just pull in the wings and fasten it! Plus, I love how sleek the whole diaper looks with all the snaps and buttons primarily hidden--it's got a cute little "turtle shell" type of look, is how I described it to my hubby! Available in a variety of cute boy, girl, and gender-neutral prints, this diaper is also super fashionable and cute enough to wear with no cover at all, especially in the summer! We never had a leak while wearing this diaper, whether from playtime to naptime, to double stuffing at bedtime, and I think I can attribute that the the great fit--as long as you take the time to carefully position your inner elastics, you should be good to go. I was shocked at how well the thin bamboo inserts absorbed, though I do with they would have laundered a little cleaner in terms of staining--though a bit of extra staining is to be expected from all natural fibres. I would recommend line-drying this insert in the sun to reduce staining and then tossing it in the dryer for the last 5-10 minutes to reduce the typical "crispiness" that natural fibres can get with purely air drying them. Overall, this is a very neat diaper with great new North American, patented technology. The only down sides are the bit of a learning curve with it as it does function a little differently than other pocket diapers you might be used to, but if you are looking for something versatile and effective, this is a great new diaper line to investigate! Head over to the Evolution Diapers right now to buy one of these innovative pocket diapers of your very own, for only $23.99! Plus, if you mention in the comment box at checkout that you are purchasing because of this blog review, Stacee will throw in a free doubler with your order! Plus, currently, free shipping or 1/2 price international shipping is available! 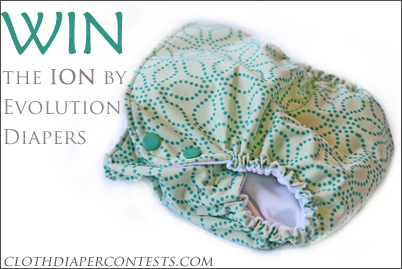 Evolution Diapers is also offering one lucky winner a one-sized Evolution ION pocket diaper in their choice of available print! Mention your favorite diaper print or product sold on the Evolution Diapers website. 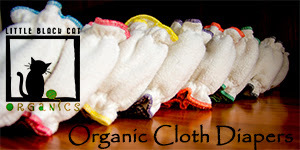 Make a purchase from the Evolution Diapers website. Give yourself 2 entries for each item purchased & mention what you bought. Final details: I received no financial compensation for this review or giveaway, though I did receive the sample items free of charge. All opinions shared are my own, and I was not persuaded to share anything other than my own thoughts. Other users may have different experiences with this product than what I have shared. This giveaway will end on June 13, 2011 at 11:59pm MST and is open worldwide. Winner will be chosen randomly using random.org’s services. The winner will be contacted by email and will have 48 hours to reply before a new winner is chosen. The prize will be supplied and mailed out to the winner by the sponsor of this giveaway. Following you GFC - The FTM. I like the Ferne print. I'm a fan of CDC&G on Facebook. Elizabeth Anderson. New to cloth diapering and have not heard anything about the Evolution brand till your review (thank you!!!) but I would like to try the Evolution Ion in the jungle print! I love the ION diaper in grateful! i like the punk rock ion! favorite print is In the Jungle. i like evolution diapers on FB and left a comment on their wall. What a great giveaway! Following you through google. Thanks! I love the Grateful print! I liked Evolution Diapers on FB! I follow you via GFC as Mrs. Martinet. I like the jungle print! Tweeted about the contest too! I went to Evolution Diapers and liked the "grateful" print the best! Ferne print is super cute, I LIKE! I like Evolution Diapers on facebook. and said thanks for the giveaway! I vote for you on the fence! Just voted for you at picket fence! I like you on facebook and follow the blog! My favorite diaper from evolution is the ION in Ferne! My favorite print is Punk Rock! "Like" evolution Diapers on Facebook. 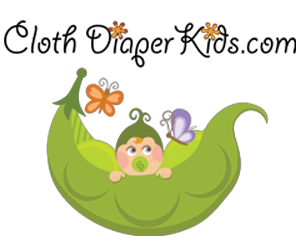 I am aaf of Cloth Diaper Contests and Giveaways on Facebook as Tiffany Byrd Church! Fan of Evolution Diapers on Facebook as Tiffany Byrd Church. Following on Twitter as Pipersmom2009. Subscribed to email updates with same email. Follow with Networked Blogs as Tiffany Byrd Church. Blogged on my little blog! I "like" CDC&G on Facebook! My favourite is the Rockstar print. I "like" Evolution Diapers on Facebook! I 'Like' Evolution Diapers on Facebook and I commented on their wall. My favorite prints are In the Jungle and Ozone.